Happy Friday everyone!! If you have today off, I'm very jealous of you. I used to get Good Friday off, but now instead we get "Founder's Day," or the Friday before Labor Day. I'm sad about it now, but I'm guessing I'll be pretty pleased come August. Today I'm sharing a couple of things I'm currently crushing on. I didn't mean to make this a "it's Friday so I'm posting about five things" post, but you know, things happen. 1. It's finally almost sandal season, and I am ready! If a pretty pair or two (like these from Banana Republic) make their way into my closet, I won't be mad. 2. Old Navy's graphic tees are making me so happy right now. They aren't all available online, but there are some pretty Paris themed tees in the stores that I need to get my hands on. 3. I mentioned that my sister and I were blasting some musicals last weekend, and one that was on repeat was Dogfight. It may be a terrible premise (Marines each try to bring the ugliest girl to a party, hence, a Dogfight), but it's actually a really good show. 4. 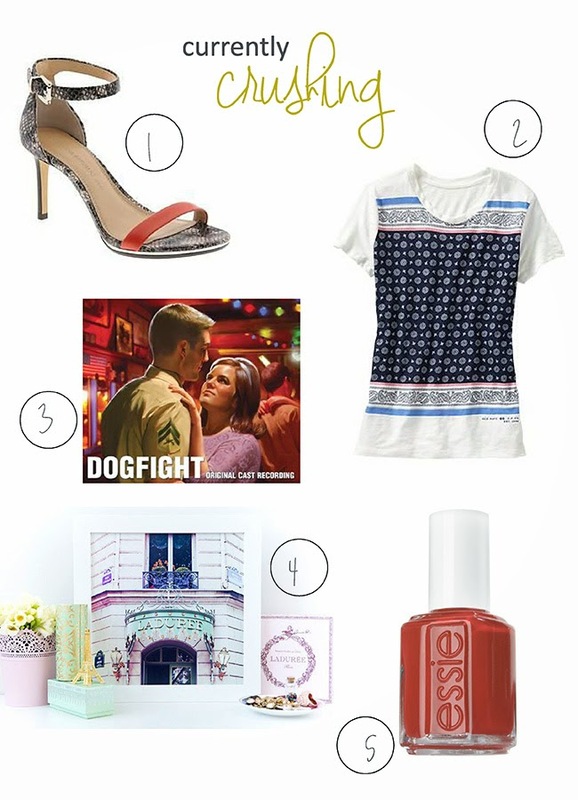 I'm not sure where I saw the link to Anna With Love's shop, but I am freaking obsessed with her Paris prints. If my house was a little more dainty and feminine, I would probably fill the whole thing with them. 5. I said on Instagram that I'm slightly creeped out by the name of this color ("chubby cheeks") but I've been wearing it on my nails (and now my toes) for three weeks straight (and will probably keep wearing it until it's time to bring out my fall colors). Those heels from BR - LOVE! Love those heels and that t-shirt! So cute! I'm definitely lovin' Old Navy Graphic Tees - they also have some awesome jewelry this season! Ahh those heels are fabulous!! I just wish I had more reasons to buy shoes like those. I'll be jealous come August...trust! Hahaha I kinda love the name of that color "chubby cheeks". I love when make-up has ridiculous and cute names. I bet that color would look gorgeous paired with the sandal (#1).